Chiranjeev Milkha Singh could not have asked for more. Son of the living legend Milkha Singh, the 34-year-old golf icon from Chandigarh emerged as the new messiah on the world golf circuit when he clinched the Volvo Masters in Spain. It was a virtual coup on the Spanish greens with the home crowd of Spain’s Sergio Garcia virtually breathing down his neck. The Chandigarh golfer kept his cool in the face of stiff opposition from big guns like Ryder Cup stars Padraig Harrington and Luke Donald, besides the home favourite Sergio. The golf triumph on Sunday got him his lifetime’s best prize-money of Rs 3.8 crore. The historic win came almost at the same time as India crumbled before Australia in the Champions Trophy cricket match at the PCA stadium in Mohali. It was the biggest golf triumph by any Indian on European soil. Talking to The Tribune over the telephone as he headed for Osaka on a tour of Japan, Jeev, as he is affectionately called by his friends, said: "It was a fine feeling. It was a dream come true." "The China Volvo Masters was no fluke. I had to prove it. Now I look forward to clashing with Tiger Woods in the HSBC Open in Shanghai," said Jeev, sounding relaxed. He talked about his new innings which had started with just the right strokes in the China Volvo Masters in April. The Spanish victory had given him a new determination. He wished to forget the seven years spent in virtual limbo. Giving details about the double Volvo triumph, Jeev, who turns 35 on December 15, said, he did not look at the scores throughout the game. But, he admits, after hitting a birdie on the 17th hole, "I glanced at the leaderboard. It showed I had a two-stroke lead over Sergio Garcia. That is where I lagged. Two strokes ahead and the last hole to go. I took that putt a little casually. That cost me one stroke. I won the title by one stroke. Had I not seen the leaderboard, it might have been a two-stroke win". But the new-found determination has given Jeev another chance to take on Tiger Woods. That Jeev can take on the world champion was amply demonstrated during a clash with the golf tiger in Dubai some years back. Jeev virtually stepped on the tiger’s tail when he took the lead in the first two rounds. But after that Jeev had a very bad patch in his golfing career. Many critics dubbed him as a "spent force". But whenever I met his father, Flying Sikh Milkha Singh, he appeared hopeful. He once said, "My son’s best is yet to come." Milkha Singh created history in the 1960 Rome Olympics when he broke the world and Olympic record, finishing fourth in the 400-metre race. Recalling those moments, Milkha Singh said the strain before the final was overwhelming. There was a two-day gap between the semi-final and the final. He was not allowed to talk to any mediaperson. In comparison, he said his son Jeev had played a natural game. 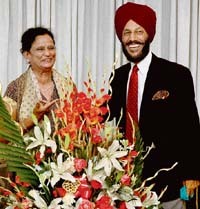 A big bouquet adorned the living room of Milkha Singh’s Sector 8 residence on Monday, when I buttonholed him. The Flying Sikh and his wife Nirmal were overwhelmed by the congratulatory messages and bouquets. Recalling Sunday night, Nirmal Milkha Singh, who captained the Indian volleyball team as Nirmal Saini, said her heart pounded faster and faster. And this continued till the last putt was played. Reliving those moments, she said: "It was a see-saw game. The excitement mounted as the lead changed sides. Jeev appeared calm. The crowd continued to cheer the home favourite. With two holes to go on the final day, the scores were even. Then the Spaniard hit a bogey on the 17th hole. In reply, Jeev executed a good drive. The ball travelled and rolled into the hole — it was a birdie. I missed a heartbeat. Yes, Jeev was on the threshold of creating golfing history. And that came after a missed stroke on the last hole." "‘Jeev has done it’ I shouted, as tears of joy rolled down my cheeks." said Nirmal. It’s the biggest victory of my career so far. I think this is going to stay with me for the rest of my life. It’s a special one, and it means a lot to me. It is a dream come true. I am feeling on top of the world. I had set some goals for myself like breaking into the top 100. And here I am, very close to realising my dreams. Earlier, I used to put myself under pressure by thinking about the end result. Now I take every event as it comes. This has reduced the pressure and I have become more relaxed. I want to maintain the momentum in Japan. Barely had the live coverage ended, the Singhs were flooded with congratulatory messages. Golf enthusiasts did bhangra as the hosts opened champagne bottles. 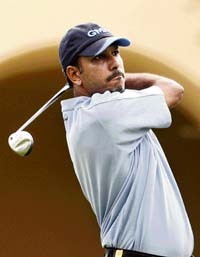 Milkha Singh said the Volvo China Open triumph in April this year was the first major win for Jeev. Here, he hastened to add, that luck also played a role. One of Jeev’s drives saw the ball landing in the jungle. The ball was lost, or so it seemed. The penalty could have been two strokes. But as luck would have it, the man who had picked up the ball was caught. The ball was placed at that spot again. The green was not visible. A mere one-feet opening at a distance had to be cleared. Jeev took the stroke. The ball sizzled past a tree bark, came out of the one-foot opening and landed on the green. This particular stroke brought back the confidence that was needed at that time. 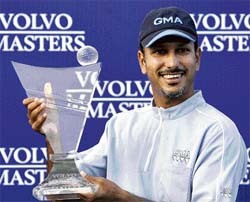 Jeev went on to win the China Volvo title. The proud father said Jeev was a born fighter. He recalled the days when he and Nirmal were both opposed to Jeev taking up any sport seriously. He said: "We had suffered. Recognition comes very late in this field. And I know it very well"
As a child, Chiranjeev was good at cricket. After a brief stint at St John’s School, Chandigarh, he was packed off to Bishop Cotton School, Shimla. Jeev captained the school team. Kapil Dev’s coach, D.P. Azad, told Milkha Singh that his son had the potential to be a good cricketer. He could be a good stroke-player. Milkha Singh asked the physical education teacher at Bishop Cotton School to put his son through a drill of physical fitness. "Make him sweat, make him run and make him exercise till it hurts," were the words of Milkha Singh. But Jeev’s first love continued to be golf. His performance on the greens, whenever he was in Chandigarh, bore fruit. He took part in the National Junior Golf in New Delhi and triumphed in 1985. That victory also gave him a three-week coaching assignment in London. Then there was no going back for Jeev. He stood out on the greens. He was selected for the Junior World Cup in Melbourne (Australia) where he finished third. What a coincidence, because it was in Melbourne that Milkha Singh had taken part in the Olympics in 1956. Also being a good scholar, Jeev got a scholarship from Abilene Christian University, Texas. He scored another first when he became the first Indian to win the Collegiate Golf title in the US. The labour he put in saw Jeev march on the pro circuit of the US Tour. In 1996, Jeev created another record. He recorded four-round scores of 66-66-65-65 in the Philip Morris Asia Cup leg of the Omega Tour. Jeev’s performance shows that Indians have arrived on the world golfing circuit — Tiger Woods watch out, the Indian tiger has arrived. I am all set to meet Tiger Woods in the HSBC Open in Shanghai, which will be held soon after the current Japanese tour." A fully charged Chiranjeev Milkha Singh is all set to take on the might of world golf icon Tiger Woods in the HSBC Open in Shanghai. With the Volvo double in his bag, Chiranjeev still remembers the 2001 Dubai clash with Tiger Woods, when he came very near to upsetting the Tiger’s applecart. That year Chiranjeev had come out of forced hibernation because of a ligament injury he suffered in 2000. Pitted against Tiger Woods and Thomas Bjorn of Denmark in the 2001 Dubai Golf International, Chiranjeev started his game under foggy conditions at 3 pm. The visibility was poor. This was in sharp contrast to the morning weather when Tiger Woods and Thomas Bjorn had played identical eight-under cards. Chiranjeev could complete only 14 holes with a score of two under. He shot three birdies on the remaining four holes the next morning for a first round card of five under. The second round saw Woods playing a four-under card. Jeev outsmarted the Tiger, returning a six-under card to be just one stroke behind the world ace. Recalling those moments, Chiranjeev said: "It was amazing. I was virtually on the tail of the Tiger. At that stage I did feel nervous. Here was a golfer I had always adored as I watched him executing his strokes on TV." As he set out on the third day, nervousness was writ large on Chiranjeev’s face. He played a poor one-over on the first nine. But then seeing his parents and the crowd of Asians egging him on, he again struck a bright patch, scoring birdies on the 11th, 12th, 13th 15th, 16th, 17th and 18th holes. But this comeback was too late. The damage had been done on the first nine. Chiranjeev virtually gave up the game on the fourth day. He finished four strokes behind Tiger Woods. The title was won by the Danish player. That Dubai performance should be a reminder when Chiranjeev meets Tiger in Shanghai. — D.B.